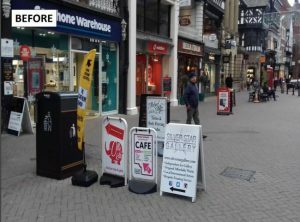 Thanks to the hard work of Dial’s West Cheshire Access Group, Cheshire West and Chester Council (CWaC) launched strict new rules on the use of A-boards last January to help disabled or visually impaired pedestrians get around town easier which they have now vowed to keep in place. Read the full article in The Chester Standard, here. Dial’s West Cheshire Access Group work to improve access to services and facilities in West Cheshire so that disabled people can participate equally in the community. Meetings take place on the second Thursday each month at 3pm in the Dial House Cafe, Hamilton Place, Chester CH1 2BH. ‘Drop-in’ meetings also take place here every fourth Thursday of every month (except December). The next meeting is due to take place on Thursday 14th February, where they will be joined by Jochem Hollestelle and Chris Capes from Ellesmere Port Town Centre Improvement Team and Cheshire West and Chester Council for a discussion of the access issues detailed in the plans and during construction of Ellesmere Port Town Centre. If you would be interested in joining this discussion, or hearing about future West Cheshire Access Group meetings, contact us. ← You chose us to win £4k with Tesco Bags of Help!